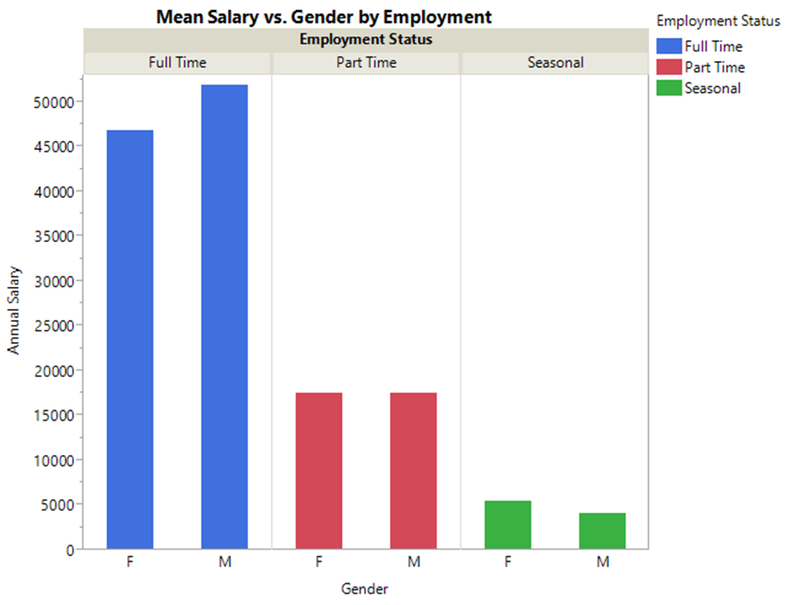 Using the same municipal employee data from data.nashville.gov as the previous post, here I am looking at whether there is evidence of gender discrimination in the salaries of Metro Nashville government employees. Obviously this is a pretty complicated issue, and I am only really going to scratch the surface of it. Mostly this is just a fun exercise for me. 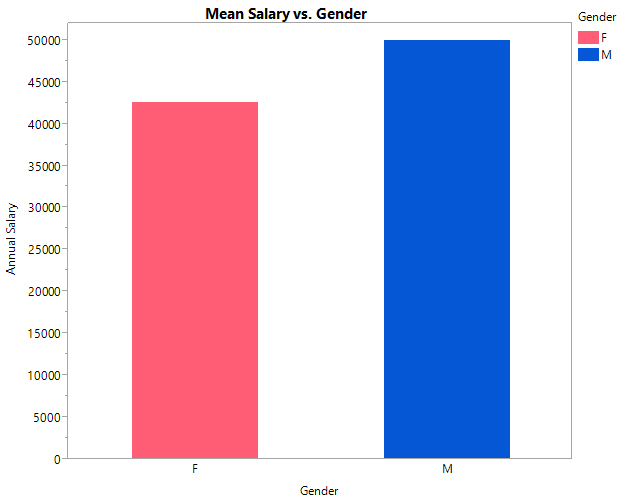 Okay, so where to begin: First, I think, it makes sense to begin by just comparing mean salaries by gender. If this doesn’t show evidence of discrimination, then there isn’t much merit it going further. 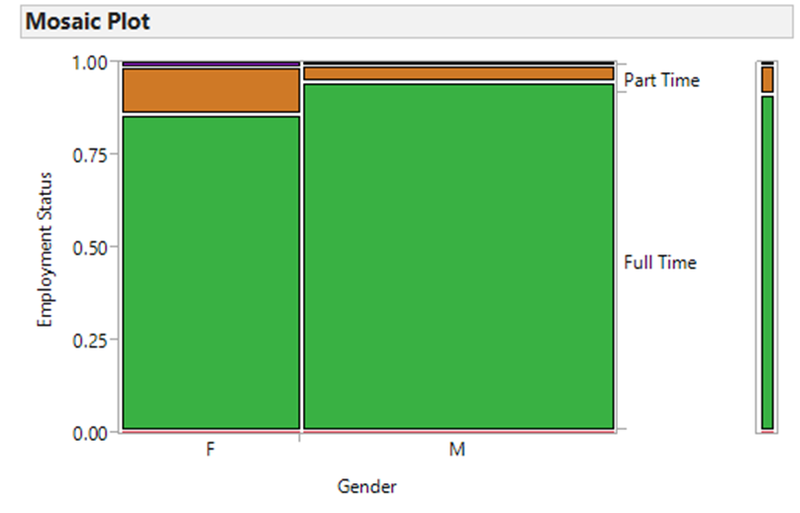 In fact, as the next two figures show, there’s a pretty big difference in mean salaries between men and women. The mean salary of men among municipal employees is $7,487 higher than for women. Not surprisingly, this is statistically significant, so the observed gap is more than what we would expect due to chance if mean salaries were equal. (It’s not shown but an f-test showed unequal variances between the two groups of salaries, which is why I assumed unequal variances for the t-test). But wait – maybe men tend to be over-represented in full-time work while women tend to be overrepresented in part-time work. That could explain the observed difference, not discrimination (although I think that could still show evidence of systematic disadvantages [or at least disincentives] for women in employment). And, indeed, it is the case that there is this kind of difference employment status between these two groups. However, this doesn’t fully explain the difference in salaries. Even within these categories, men are paid more than women. A difference remains. Mean salary is $46,000 for full-time women vs $52,000 for full-time men – a difference of $6,000 or about 80% of the difference we observed without any adjustment. Tangent: why part time wages for women are slightly higher is a puzzle – when I looked at median instead of mean, this went away, and so the median part-time man earns more. This probably means there are outliers distorting the picture for part-time (some part-time women is getting paid much higher than average, perhaps??). Another important check is difference in job. 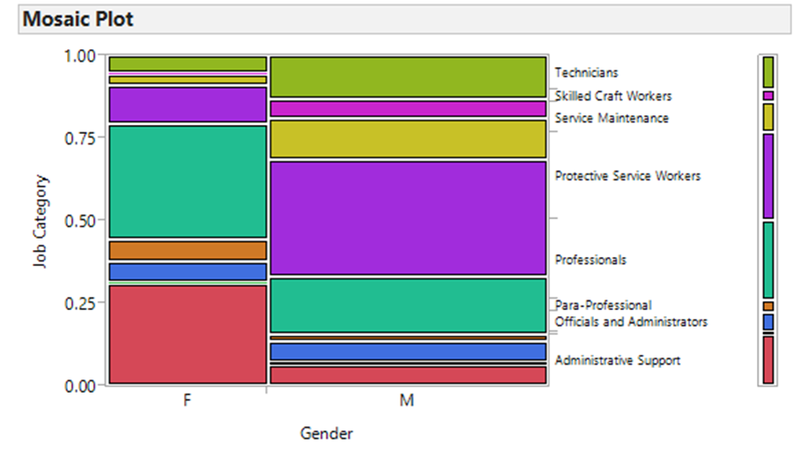 Using EEOC reported job categories, I can look at whether women and men tend to be working different sorts of jobs, thus explaining the different salaries. And indeed, there’s a visually apparent (and statistically significant; Pearson’s X^2 < 0.0001) difference in the frequencies of jobs by gender. A much larger percentage of women are doing “administrative support” ($35,000 annually) and “para-professional” ($26,000) work. A larger percentage of men are doing “Professional work” ($53,000) or “technicians” ($58,000). So this is another thing to account for, since it could be driving differences in salaries. I think the differential prevalence of women in the professionals category could signal some important inequities but is not per se discrimination in the sense of unequal pay for the same work. To try to give a more comprehensive account of what’s driving salary, I can do a multivariate regression. I will do this tomorrow! Oh, the suspense.